During the years 2009 to 2014, a change program took place in the hospital Saint Elisabeth in Tilburg1. Ethicists of the University of Tilburg2 supported the project. This process is described in the book 'The patient returned from gone away: Working at professional, loving care in the hospital'. It was to a considerable extent inspired by the publication of Annelies Van Heijst: 'Professional, loving care. An ethical view on professionalism'. Therefore, the change process in the hospital was put into action under the motto: 'a loving hospital'. The researchers concluded that change processes in care are very often directed from the outside, by ideas and influences that come from other organisations. There are many examples of this. Engineers of the Toyota factories developed 'Lean'. Insights from the aviation sector are often the inspiration for safety protocols. Ideas about consumer satisfaction also have a significant influence on care. Even the organisation of amusement parks seems to be a source of inspiration for the organisation of care. Consequently, one can say that the management is developed from outside to inside. But the activity of nursing and curing changes no doubt when we organise it according to a model of production. If one frames care as production, one shall be inclined to standardisation and segmentation of action in small parts. Annelies Van Heijst states that care is not production, but an expression of concern with the suffering person. It is a way of acting, different from production. To reconcile the organisation of care with these of production, caregivers need to translate the story of the patient in another 'language'. They tend to tell the story of the patiënt all over again, in their medical and professional jargon. The "good patient" is he who adapts himself to this retold story. This adaption causes a certain alienation of the patient: not his story, in which he tells his problems in his words, is the starting point in care, but the way caregivers cope with it. 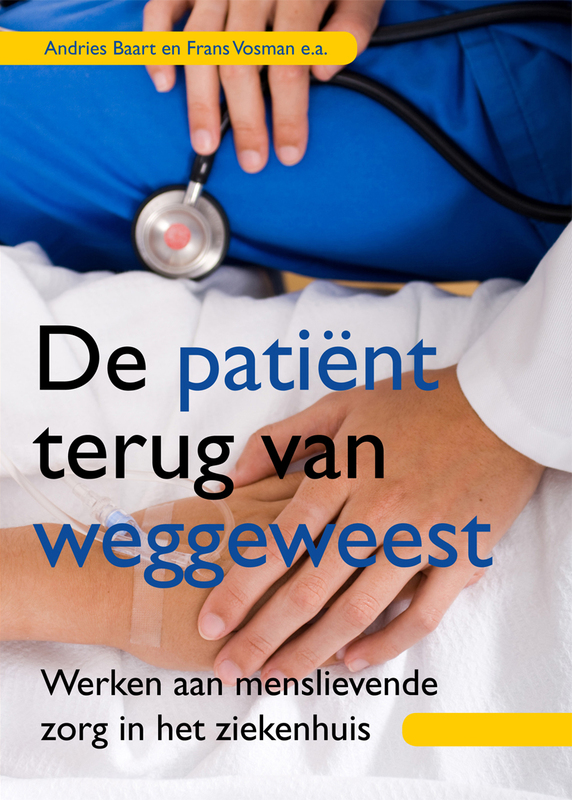 This "translation" has a purpose: "the actual story of the patient gets transformed into an account by which caregivers can get to work in the context of their organisation" (p. 148). People, patients or their relatives, who don't fit in this narrative, are therefore seen as 'difficult'. But it is not the patient who is difficult; the whole problem is that the organisation is not capable of coping correctly with the many tasks with which the patient sees himself confronted. This inability to join the perspective of the patient has severe consequences. For instance, one can state that elderly patients frequently have permanent loss of function after hospitalisation, because an admission is a disturbance of daily life. All roles which fall beyond the illness, are temporarily deactivated. The caregivers reduce the patient to the disease for which he is hospitalised. The person himself disappears for a moment out of focus. That doesn't mean that the caregivers can't see the patient as a human being. Of course, they do that a lot of times, but this "person" comes in the picture, only after the disease is treated. This finding comes close to the theme of this website: as a person, we are body and mind at the same time. But despite the great importance that in our culture is attached to the human being as a "person", we fail to approach "man" and "body" simultaneously in an adequate manner. This reduction of man to patient leads to "epistemic injustice": we don't see the patient anymore in his capacity of someone who knows. The patient has knowledge about his experience with the disease and about the tasks he has to fulfil as an ill person, but the caregivers insufficiently recognise this knowledge. 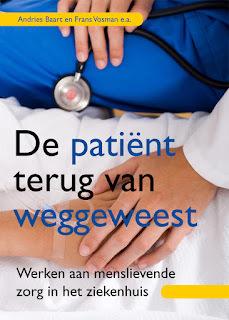 Andries Baart and Frans Vosman define good care as " the efforts to sustain life as it is weak, in pain, in danger, broken, threated, fragile, and when it loses its quality, its autonomy and its independence" (p. 54). But our in culture, a human being is perceived so frenetic as autonomous, that we hardly can see the ill human being as a full person: we simply have no frame of reference for it. We have in a certain sense two perspectives which are separated from each other: the autonomous person here and the suffering person there. The first we see as a subject, the other as an object of care and examination. It seems we fail to see the one and the other perspective together. Consequently, we continuous have to switch our perspective. Therefore caregivers have to learn to join the perspective of the patient again and again. They have to involve in care, the problems with which the patient is confronted. And therefore they have to avoid to translate these problems into the professional jargon. These problems are partly "medical". For instance, the patient is confronted with the problem to cope with pain and discomfort who are the consequences of the illness and the treatment. But very often, these issues are situated beyond the scope of the medical treatment. For instance: 'who shall look after my dog, when I am in the hospital'; or 'how can I ensure that my partner doesn't get worried too much'; or 'can I lose my job when I stay in the hospital'; etc. But at the same time, caregivers also have to remain using their language, because it is adequate to be used in the professional process. That means that we have to do with a very fragile equilibrium: to join the language of the patient, without losing their own jargon. This requires an intensive learning process, in which caregivers have to question themselves continuously. They have to learn to reorient the reflexes they have learned. In this process, it is essential how caregivers give attention to the patient. They do this in very different ways. First of all, one can see giving attention as constitutive for care. But one can also see it as institutional: it is necessary to communicate with the patient, if one wants to convince him of the necessity to carry out a set of care tasks. It's getting worse if caregivers see attention for the patient as awkward because it makes the many care tasks they have to execute heavier. There are even caregivers who see giving attention to the patient as a hindrance for care of high quality because it hampers the accurate execution of the procedures they have to execute. These different positions lead to diverse cultures of care in the care institutions. A culture of care enclosed in itself stands for institutional encasement, in which an "objective" approach to care is highlighted and in which exists a self-referential culture of care. Further, we can speak of an open culture of care in which there still is a clear institutional encasement, but where is also focused attention on the person of the patient. At last, in a relational culture of care, there remains an institutional encasement of course, but the care is primarily oriented to the patient. To make this possible, learning communities, consisting of caregivers were set up in the hospital Saint-Elisabeth. In this way, they wanted to let the change in the hospital start from teaching processes, who are developed in the hospital itself. The target of the whole operation was to achieve a broad relational culture of care. And in fact, a significant number of steps have been taken in that direction. But at the same time, the researchers encountered some stubborn difficulties. A hospital is after all also a high tech, rationally controlled organisation in which a relational culture of care is not very obvious. A "loving" hospital is a beautiful dream, but reaching this goal shall unavoidable happen with trial and error. 1 At this moment, this hospital is merged into a larger organisation: the Elisabeth-TweeSteden hospital. 2 This chair is later transferred to the University of Humanistics in Utrecht.